Data sharing is the first priority in web conferencing. 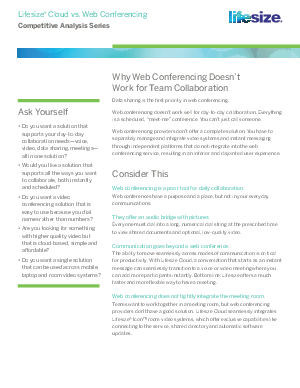 Web conferencing doesn’t work well for day-to-day collaboration. Everything is a scheduled, “meet-me” conference. You can’t just call someone. Web conferencing providers don’t offer a complete solution. You have to separately manage and integrate video systems and instant messaging through independent platforms that do not integrate into the web conferencing service, resulting in an inferior and disjointed user experience. Download now to learn why Lifesize Cloud is the ONLY solution you need!